Growing Rosemary, officially named Rosmarinus officinalis, in nowadays you will have one of the most widespread aromatic plants in the world. Due to its strong and spicy fragrance, as well as to its therapeutic properties, growing rosemary is appreciated and used by various cultures. Native of Europe, Asia and Africa, it was acclimatized in many parts of the world, being nowadays cultivated in domestic conditions as a decorative plant, as well as for culinary and medical purposes. While being a relatively resistant plant, as part of the evergreen family, some special care is needed in order to get the best growing rosemary plants results. It can be grown in a vase on the balcony or in the garden, directly into the soil. The second option is ideal as it provides the plant with the possibility to grow at its maximum potential, on condition that you live in a mild climate. In fact, growing rosemary you can get some species of them that are sensitive to cold, risking freezing during harsh winters. As most people don’t have a garden or the possibility to protect the plants during the winter, we will focus on the modality of growing rosemary in a vase, which has the advantage that it can be moved wherever you consider more appropriate. If you follow some simple steps and rules, you can obtain beautiful plants that in time can get into real shrubs, which will be the delight of your balcony or terrace. Well, there are two ways, which could be called the easy way and the hard way. The hard way is to try and get the plants from scratch, out of the seeds. This is not the recommended method, as seeds often are difficult to germinate and the resulting plants may not be true to their parent. 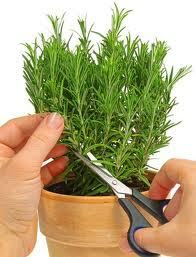 The most common way for growing rosemary is by cutting from a mature plant. The cuttings must be then placed into a container of dampened, sterile seed starting mix. Don’t forget to mist the cuttings and keep them in a warm, sun lighted place. After 2-3 weeks new roots should have already grown; at that point, transplant the tips into individual pots. You may start then treating them as real rosemary plants. Rosemary plants loves the sun; it can never get too much. Growing rosemary plant in a pot in direct sunlight, as much as possible. It should get 6-8 hours of full sunlight. Being a native sea plant, rosemary also loves sandy, well drained soils. Avoid using glass or plastic pots when you are growing rosemary plant; use a classic clay pot instead. This provides a better breathability as well as good water drainage. Adding some liquid natural fertilizer once in a while is also a good idea. Water the plant only when the soil is dry and reduce the watering during the cold season. Don’t forget to place some shards or small stones on the bottom of the vase in order to avoid water stagnation. Finally, be sure to provide a good air circulation to your plant. 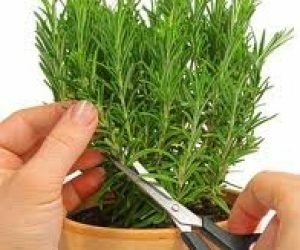 Following these simple rules you will surely grow beautiful rosemary plants which will be a pleasure for your eye as well as for your palate.